Happy New Year everyone! I hope this year brings you loads of good things, including loads of crochet of course 🙂 I have been thinking about what projects I want to start working on this new year, I have loads of magazines and books but put them aside on 2014 to spend more time designing. I will continue to work on my own patterns but I do miss working on other people’s designs, there are such lovely things out there that I want to give a try. This is a long list and I am aware that there is probably not enough time in the year to crochet all this and also do my own patterns, but a girl can dream right? Leaps Cardigan by Annelies Baes: I came across this cardi on Issue 57 of Inside Crochet and immediately fell in love. As you know I am always in the lookout for some wearable crochet and this pattern definitely hits the mark. 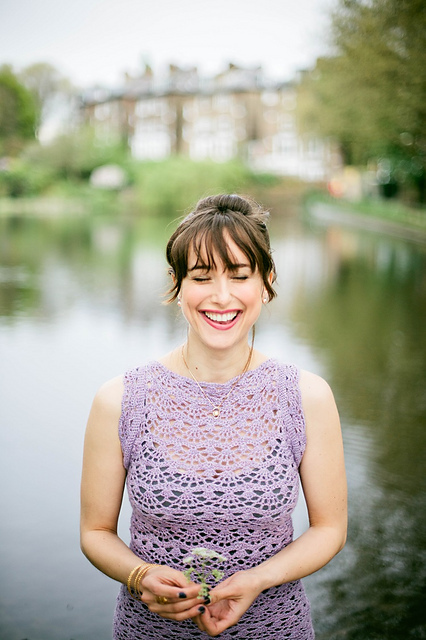 Penelope Top by Jennifer Reid: Another find from Inside Crochet, this top is gorgeous and can see myself wearing it all summer long. I think that the alpaca in the yarn used makes it look even nicer so will try to find a similar yarn to the one used by the designer. Rockin Red Dress by Doris Chan: I purchased a few more Interweave Crochet issues during the holiday sales and there were quite a few projects I really liked. I always check the patterns on Ravelry and was surprised to find that most of the ones I had liked had very poor ratings and comments of badly written patterns. I am not sure if this is common for Interweave Crochet, I had an idea that their patterns weren’t so throughly checked and I believe I had mentioned it before, but I didn’t think it would be that bad. Anyway, I did find a beautiful crochet dress by Doris Chan, she is quite a famous designer and her pattern had good reviews. I have found that for Interweave magazines it is safer to look for patterns with known names, I guess they have a reputation to keep and more experience as well. I have never crocheted a dress but this is really stunning. 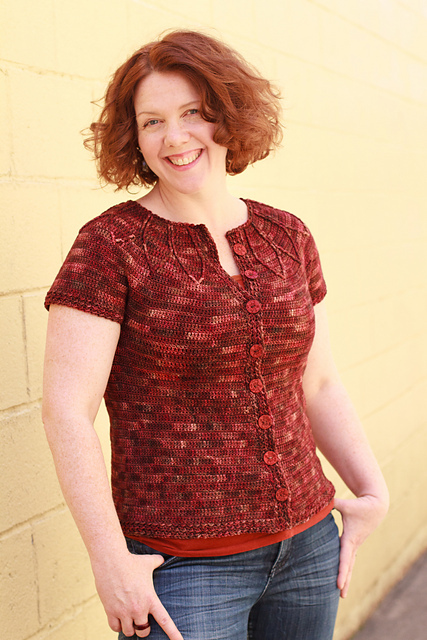 Quartz Lace Top by Dora Ohrenstein: You know by now that I am a fan of Dora Ohrenstein, but didn’t know this pattern was hers until I looked it up just now! I saw it on Ravelry a while ago but found it recently in one of the Interweave magazines I bought. Moving on to books now… I have purchased a few books this year, haven’t reviewed them yet but thought I could still list the projects that are at the top of my wish list. As you can imagine some designers will sound familiar! Haru from Everyday Crochet by Doris Chan: I found this book at a charity shop at a very cheap price so had to get it. My favourite pattern is this striped long cardigan, I love how colourful it is. Buttoned Capelet from Hook, Stitch, Give by Kat Goldin: There are quite a few things I would like to make from this book including this beautiful capelet, I am so drooling over that yarn! 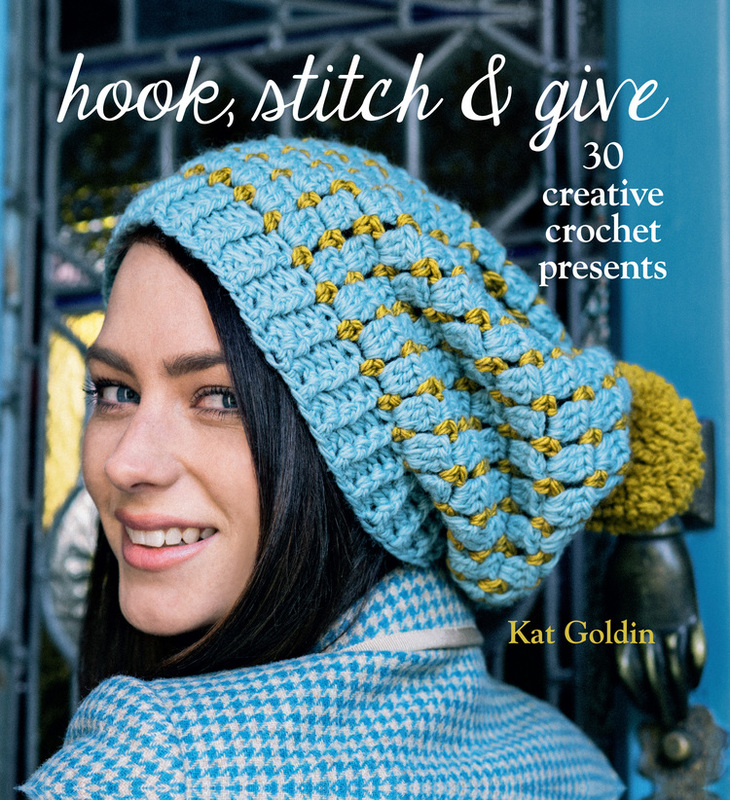 Slouch and Bobble Hat from Hook, Stitch, Give by Kat Goldin: Love the hat, love the colours, love the pompom. Love, love, love. Lorelei Pullover from The New Tunisian Crochet by Dora Ohrenstein: This pattern uses a vintage tunisian stitch adapted by the designer, and it is like nothing I have ever seen. Finally, I have a few patterns found on Ravelry and other places… and then I’m done I promise! 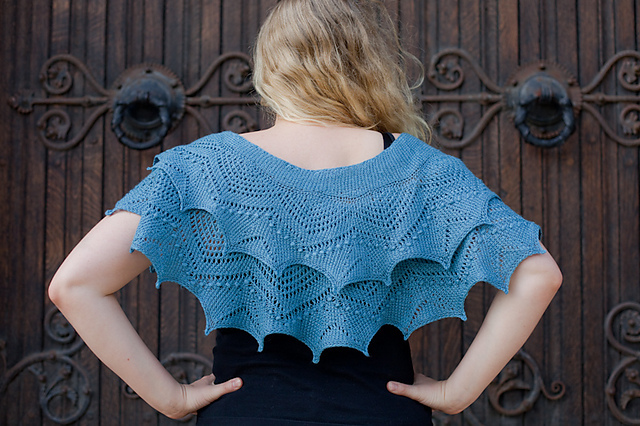 Piped Petals Cardigan by Linda Permann: The yoke for this cardigan is so lovely! It looks very flattering as well. 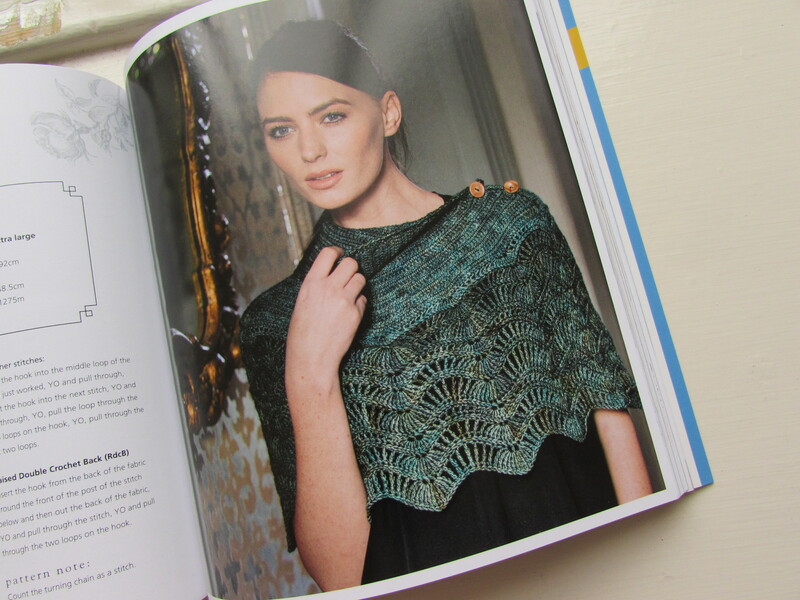 Freyja by Aoibhe Ni: I purchased the Legendary Shawls eBook and still have many left to do… this one is at the top of the list though! 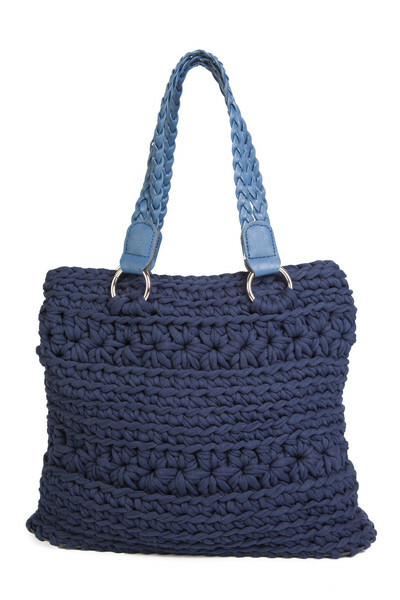 San Marino Bag by Hooked: I have never liked crochet bags, I had never really found a pattern that doesn’t look a bit tacky but this one caught my eye. I love that the kit comes with the handles as well. Let me know in the comments if you have any patterns in your queue for next year that you can’t wait to try! Thank you! It will be a quest indeed! Love your choices! I haven’t made a list, as I am a) very slow and b) very distractable. Interesting you’ve had problems with Interweave–it’s my favorite mag. I love the Doris Chan dress, although I doubt i’d wear it. I’ve threatened my Trekkie sister with it–it’s way out of her comfort zone!